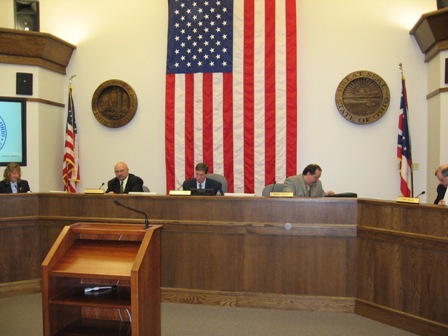 APPROVAL OF MINUTES - Council meeting and Finance Committee meeting of January 22, 2008. EMERGENCY ORDINANCE NO. 2008-05. AN ORDINANCE AMENDING EXHIBIT "1"
OF EMERGENCY ORDINANCE NO. 2008-01 TO PROVIDE FOR AN INCREASE IN THE NUMBER OF LIEUTENANT POSITIONS IN THE POLICE DEPARTMENT TO TWO, THE ELIMINATION OF THE POSITION OF CAPTAIN, AND DECLARING AN EMERGENCY. EMERGENCY ORDINANCE NO. 2008-06. AN ORDINANCE ACCEPTING GRANT FUNDS FROM THE DEPARTMENT OF HOMELAND SECURITY FOR THE PURCHASE OF SELF-CONTAINED BREATHING APPARATUS FOR THE FIRE DEPARTMENT, APPROVING THE GRANT AGREEMENT ARTICLES, AUTHORIZING THE PAYMENT OF THE CITY'S SHARE FOR SAID PURCHASE, AND DECLARING AN EMERGENCY. EMERGENCY ORDINANCE NO. 2008-07. AN ORDINANCE ACCEPTING GRANT FUNDS FROM THE OHIO DEPARTMENT OF PUBLIC SAFETY FOR EMERGENCY MEDICAL SERVICES TRAINING AND EQUIPMENT, ESTABLISHING A FUND THEREFOR, AND DECLARING AN EMERGENCY. EMERGENCY ORDINANCE NO. 2008-08. AN ORDINANCE ESTABLISHING THE OHIO PEACE OFFICER TRAINING FUND, AND DECLARING AN EMERGENCY. ORDINANCE NO. 2008-09. AN ORDINANCE DEDICATING REAL PROPERTY TO BE USED AS PUBLIC RIGHT-OF-WAY ON SOUTH AMERICAN WAY AND LAWTON AVENUE. ORDINANCE NO. 2008-10. AN ORDINANCE LEVYING ASSESSMENTS FOR THE REPAIR OF SIDEWALKS, CURBS, GUTTERS, AND DRIVE APRONS. ORDINANCE NO. 2008-11. AN ORDINANCE AUTHORIZING THE CITY'S PARTICIPATION IN FINANCING PUBLIC IMPROVEMENTS FOR THE CHELSEA MALL PROJECT AND AUTHORIZING THE EXECUTION OF A SERVICE AGREEMENT TO EFFECTUATE SUCH FINANCING. EMERGENCY RESOLUTION NO. 10-2008. A RESOLUTION AUTHORIZING THE CITY MANAGER TO ENTER INTO A CONTRACT BY AND BETWEEN THE CITY OF MONROE AND POLICE DOG SERVICES, INC. FOR THE TRAINING OF K-9 OFFICER GREGG MYERS AND THE PURCHASE OF A K-9, AND DECLARING AN EMERGENCY. EMERGENCY RESOLUTION NO. 11-2008. A RESOLUTION ACCEPTING DONATIONS FROM VARIOUS DONORS TO BE USED FOR THE PURCHASE, TRAINING, EQUIPMENT, UPKEEP, AND MAINTENANCE OF THE MONROE K-9 OFFICER, AND DECLARING AN EMERGENCY. EMERGENCY RESOLUTION NO. 12-2008. A RESOLUTION AUTHORIZING AND DIRECTING THE CITY MANAGER TO ENTER INTO AN AGREEMENT BY AND BETWEEN THE CITY OF MONROE AND TYLER TECHNOLOGIES, INC. FOR THE PURCHASE OF FINANCE AND HUMAN RESOURCES SOFTWARE, APPROVING THE PURCHASE ORDER FOR THE PAYMENT OF THE SOFTWARE, AND DECLARING AN EMERGENCY. EMERGENCY RESOLUTION NO. 13-2008. A RESOLUTION AUTHORIZING AND DIRECTING THE CITY MANAGER TO ADVERTISE AND RECEIVE BIDS FOR THE TODHUNTER ROAD BRIDGE REPLACEMENT PROJECT, AND DECLARING AN EMERGENCY. EMERGENCY RESOLUTION NO. 14-2008. A RESOLUTION AUTHORIZING AND DIRECTING THE CITY MANAGER TO ENTER INTO AN AMENDED LICENSE AGREEMENT BY AND BETWEEN THE CITY OF MONROE AND THE MONROE HISTORICAL SOCIETY TO PROVIDE FOR A CONTINUOUS TERM OF FIFTEEN YEARS, AND DECLARING AN EMERGENCY. EMERGENCY RESOLUTION NO. 15-2008. A RESOLUTION AUTHORIZING AND DIRECTING THE CITY MANAGER TO ENTER INTO A NON-DISTURBANCE AND ESTOPPEL AGREEMENT BY AND BETWEEN THE CITY OF MONROE AND THE OHIO CULTURAL FACILITIES COMMISSION TO PROVIDE FOR THE CONTINUOUS DELIVERY OF CULTURE ESTABLISHED BY THE MONROE HISTORICAL SOCIETY, AND DECLARING AN EMERGENCY. CONSIDERATION OF MOTION EXTENDING THE TURF MAINTENANCE CONTRACT FOR ONE YEAR FOR THE MOWING OF COMMUNITY PARK. CONSIDERATION OF MOTION EXTENDING THE TURF MAINTENANCE CONTRACT FOR ONE YEAR FOR THE MOWING OF MOUND, NORTH MONROE, AND AMANDA CEMETERIES.